The World Cup! For a long time I didn’t care about football at all, and then in 2010 I decided I was going to care about football once every four years, and here we are in 2018 with an unusual number of England games to watch and esprit de corps and so on. This country certainly doesn’t stop for the World Cup… indeed, it’s markedly less visible this time around compared to when I arrived in 2014 and the US team was doing unexpectedly well. But Randi and I have seen quite a few matches with a variety of people, including with Lauri (escapee from the suburbs!) 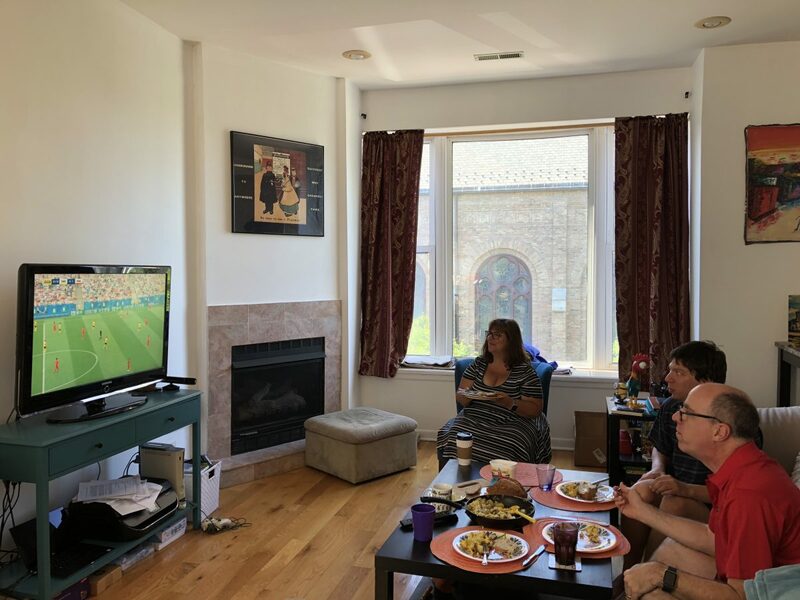 in her swanky high-rise apartment, England vs. Sweden last weekend when Randi’s family friends Elana and Steve sportingly agreed to come over for a 9am kick-off, and this morning’s anti-climactic third-place consolation match at Karol’s birthday brunch-and-football gathering. And yes, I am basically inclined to like international competitions. Most of us have these national identities, so we might as well put them to better use than trade wars/actual wars. It’s fun to learn about the fates of the Chilean and Argentinian teams with Francisco and Gonzalo over burgers at Au Cheval. (Side note: holy hell, those burgers are great. I had forgotten this lesson from last time.) It’s enjoyable to sit at the people-with-visas table at Robert’s 4th July party (America!) and have an immediate reference point for conversation which is not all about visas. It’s… well, it’s an experience when our seventy-something French landlord lets himself into our flat and starts yelling jaunty French propaganda at me when I’m trying to concentrate on a work call. The point is: the World Cup has been great, there are much worse choices than football to be your national sport, and despite England’s exit I am looking forward to the final tomorrow. I presume my landlord is too. Obviously I haven’t been playing any football myself (Years Of My Life Where PE Lessons Were Compulsory: 2000-2004) but I have been enjoying the type of game which you can sit down at a table to play. For example, with Chloe and Aaron we played Catan again (after far too long!) and Chrononauts, a somewhat tongue-in-cheek card game where you rewrite the historical timeline for nefarious ends. 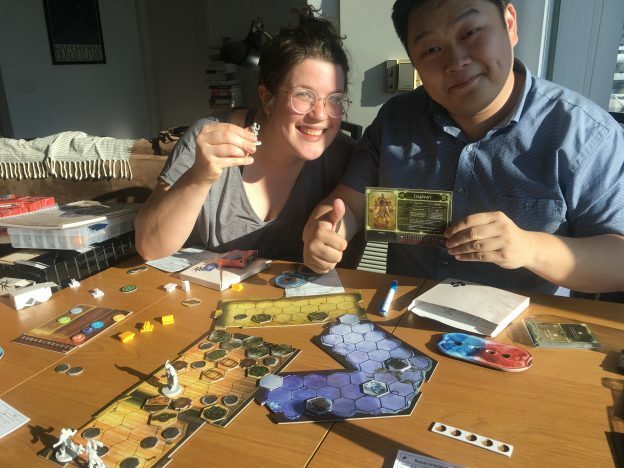 Kicking the nerd level up a gear, with Jason and Carrie we played Gloomhaven, which is all the rage, although it is essentially D&D for people without the time or energy to play D&D. On Wednesday night we made up for England’s semi-final defeat with a cheeky Nando’s and a movie, Ocean’s 8, with Ellen and Lou. Ocean’s 8 is a super fun comedy heist film, which has (per Wikipedia) a “routine storyline” because it’s a comedy heist film for goodness sake. Spoiler alert: they successfully steal things. The film also has an entirely female lead cast, and it is striking how much you notice that, as opposed to an entirely male cast which (for these characters) would not stand out. Recommended. Who should I blame for never having taken me to a Gilbert & Sullivan opera before? Isn’t this something my parents should have done? Or do I have only myself to blame, given that Sideshow Bob’s performance in The Simpsons has made it obvious for years that this was something to look into. Anyway, thanks to Catherine and AJ (mostly Catherine), this 29-year drought was ended on Friday night with The Pirates of Penzance. It’s so good! And so silly! +1 to the Victorians. Funny/pathetic story: a few weeks ago I decided it was high time to see a play at the Steppenwolf. So I bought tickets for a grisly two-hander about the legendary bloodshed behind the building of the Taj Mahal. And then about 30 minutes later I realised that I really didn’t want to see a grisly play, and successfully weaselled my way past their “no refunds or exchanges” policy to swap my tickets for a different play on the same day. The alternative on offer turned out to be The Roommate, an ungrisly two-hander about the “comical mismatch” between a “Midwestern nice” woman from Iowa and her new roommate from the Bronx. I’m quoting this intentionally vague description because I would probably not have paid for these Steppenwolf tickets other than through this accidental chain of events. Hooray for serendipity! The performances were amazing, the story took a sharp, unexpected turn which really paid off, and I can now tick the Steppenwolf off my Chicago bucket list with a feeling of satisfaction and no grisliness. On the subject of Chicago bucket lists: I had already done the Ferris Wheel (sorry, ‘Centennial Wheel’) at the unfairly-maligned Navy Pier, but I was more than happy to do it again with Randi, Arielle and their cousins visiting from Philadelphia. Technically it was a new wheel anyway, which seemed much fancier than my memory of the old one. On the subject of grisliness: I’m really good at killing flies now. I mean, really good. Our flat had a night of trauma, and as a consequence I can now stalk my fly-prey with the sleek hunting prowess of a big cat.